Illuminating the Excellent Path to Omniscience (༄༅། །ཀློང་ཆེན་སྙིང་ཐིག་གི་སྔོན་འགྲོའི་ངག་འདོན་རྣམ་མཁྱེན་ལམ་བཟང་གསལ་བྱེད་བཅས་བཞུགས་སོ།། །།, Wyl. rnam mkhyen lam bzang gsal byed) is a brief commentary by Jamyang Khyentse Wangpo on the Longchen Nyingtik ngöndro. This commentary is particularly useful for students because it goes into the various visualizations involved in the practice in great detail, and also offers advice on how to do the ngöndro as a daily practice. Illuminating the Excellent Path to Omniscience, ༄༅། །ཀློང་ཆེན་སྙིང་ཐིག་གི་སྔོན་འགྲོའི་ངག་འདོན་རྣམ་མཁྱེན་ལམ་བཟང་གསལ་བྱེད་བཅས་བཞུགས་སོ།། །།, rnam mkhyen lam bzang gsal byed, a version of the same commentary that weaves the text with the root verses of the Longchen Nyingtik Ngöndro. The latter version includes several additional prayers that were not part of Dodrupchen Jikmé Trinlé Özer’s original edition. ༄༅། །རྫོགས་པ་ཆེན་པོ་ཀློང་ཆེན་སྙིང་ཐིག་གི་སྔོན་འགྲོའི་དམིགས་རིམ་སྙིང་པོར་དྲིལ་བ་ཟབ་དོན་བདུད་རྩིའི་ཉིང་ཁུ་ཞེས་བྱ་བ་བཞུགས་སོ། །, Jamyang Khyentse Wangpo, Collected Works, Vol. བ་, p.419. 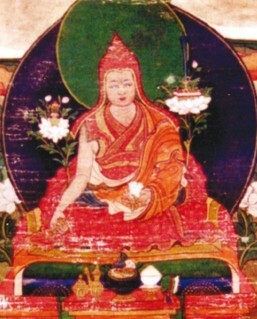 Yukhok Chatralwa Chöying Rangdrol took Jamyang Khyentse Wangpo's Ngöndro commentary as a basis for his own Ngöndro Compendium, which extends and further clarifies Khyentse Wangpo's explanations. This page was last edited on 28 December 2017, at 18:39.